• examines myths and historical contexts of HBCUs. Aside from the practical implications provided herein, the volume also provides salient context for researchers and policymakers interested in the diversification of HBCUs. Given the range and the depth of the issues covered, it is a must read for anyone interested in HBCUs in general and student success within these institutions specifically. This is the 170th volume of the Jossey-Bass quarterly report series New Directions for Higher Education. Addressed to presidents, vice presidents, deans, and other higher education decision makers on all kinds of campuses, it provides timely information and authoritative advice about major issues and administrative problems confronting every institution. Robert T. Palmer is an associate professor of student affairs in the College of Community and Public Affairs at the State University ofNew York, Binghamton. C. Rob Shorette II recently earned a PhD in higher education from Michigan State University. Dr. Shorette is an educator and researcher focused on diversity and equity in higher education, a former HBCU presidential aide, and an HBCU alumnus. Marybeth Gasman is a professor of higher education in the Graduate School of Education at the University of Pennsylvania. This chapter provides historical background on the diversity of HBCUs. It dispels myths about the diversity of early faculty and students at HBCUs as well as those working at and attending these institutions today. This chapter analyzes data on the changing racial demography of HBCU students and faculty. It also emphasizes the importance of looking beyond structural racial and ethnic diversity when discussing diversity at HBCUs. Using a collaborative, autoethnographic approach, the authors reflect on their experiences at an HBCU and the lessons learned for their sense of self as non-Black students and professionals at this institution. This chapter uses data from the Integrated Postsecondary Education Data System (IPEDS) to map White student enrollment at 4-year HBCUs from 1987 to 2012. Given that the Latino/a population at HBCUs has been steadily increasing in recent years, the authors of this chapter not only discuss some of the factors that encouraged them to attend an HBCU but also provide a picture of their experiences at an HBCU. This chapter discusses the challenges and experiences of LGBT students at HBCUs and provides recommendations to help these institutions foster a more inclusive environment for LGBT students. 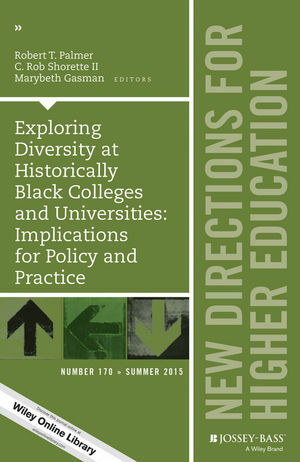 Using research and policy data, this chapter discusses how HBCUs can broaden the notion of diversity in order to become more engaged in the higher education policy arena.